Well, you guessed it. Last night I was at The Hopyard. I didn't make it last week for North Coast and thought that New Belgium (website here) sounded pretty good (Fat Tire is good, but I LOVE their Abbey and Trippel). I was hoping that one of those would be featured as I had yet to try them on tap. Due to the change two weeks ago (Samuel Adams instead of Brewery Ommegang) I thought I should call ahead. Well, again with the switch up. 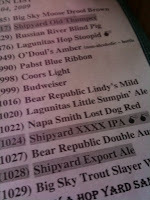 Instead of New Belgium they had Shipyard (website here). Ironically enough I wore my Shipyard Brewing Company polo shirt on Monday. You can read on previous blog entries of my visits to Shipyard while on business in Portland, ME (here and here). 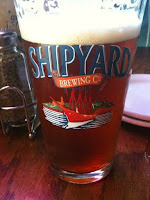 I was pretty excited about Shipyard on tap and they were featuring the Pugsley's Signature Series Shipyard XXXX IPA, a 9.25% ABV IPA with Cascade, Warrior, Summit and Glacier Hops used for bittering and Cascade Hops added for dry hopping after fermentation. The hop blend is well balanced with Malted Wheat, Pale Ale, Crystal, and CaraMalt Malts. The beer had nice citrus and pine notes to it and was very drinkable. After a couple I was feelin' it. I'm going to seek it out and buy a few 22s to keep in the "beer fridge". Afterwards my wife and I visited the local Whole Foods so I could pick up some GT's Kombucha (website here) and some Pliny the Elder (the local BevMo doesn't carry it since Russian River can't produce enough to keep them supplied). I had a bit of a mishap and a bottle of Santa Cruz Organic Lemonade and after grabbing two for my cart a third (that was precariously perched on the flat) went crashing to the floor. So much for drinking two Shipyard XXXX IPAs before shopping! On another note, The Northwest Brewing News had already hired someone to be their Bay Area correspondent, but said they'd keep my name on file in case. Sounds good to me.